You’ve prayed and prayed to the Lord and ……still no answer. When is the Lord going to answer you…what will He say and when will He say it? It’s said that there are three ways God can answer a Christian’s prayer….He can say “yes…no…or wait”. When God says…yes…you get an answer to your prayer right away. You will see the answer almost immediately or He will tell you the answer is yes and you will eventually see the blessing manifested…but God said yes right away. Then there is the “no” answers… when the thing you’ve asked God for didn’t come through….such as the loan for the new car. God said no and you have to trust His wisdom in that no. Then there is the…wait…answer. This is when you do not get a clear yes or no. In fact you don’t hear anything. Your ears are open…your heart is open…your eyes are fixed on the Lord and….nothing. Well you think you don’t hear anything…but I tell you there is a lot going on in the spiritual realm on your behalf. God is doing something and just because He hasn’t revealed an answer to you doesn’t mean He has not heard your prayer or is not working on an answer. God does not leave us hanging…He has given us the ability to hold on until the answer (whatever it may be) comes. God does NOT leave us hanging! God has given us His word, His grace and His Holy spirit to help us while we wait. We have everything we need to wait with. Why should we be anxious….haven’t we cast all our care on Him? Haven’t we taken His yoke on us? Isn’t the good Shepherd watching over us and His rod and staff comforting us? Haven’t we put our trust in Him? Did we not lean on our own understanding of the situation? Doesn’t God care for the birds of the air? Can the Lord keep us from falling? Hasn’t He given the angels charge over us? Does God really leave us hanging? 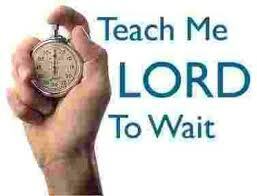 More secrets to learning to wait on the Lord is to pray to Him, worship Him and meditate on His word day and night. This will help you stay focused as you wait on Him. 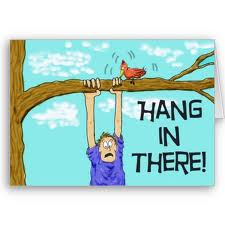 Message for today: God never leaves anyone hanging…He will say to you…yes….no…or wait. He doesn’t play games with you and say…well maybe. God will never leave you hanging! 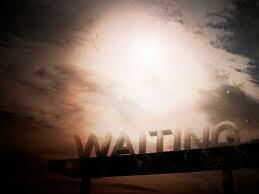 Am waiting… waiting for answer… without god i can’t do anything…. You speak truth. God bless you and answer your prayer! I wrote this post in 2011 and just saw your reply. My reply is late. Just trying to be a little joyful…. 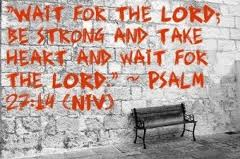 Thank you for your post 🙂 I feel inspired and ready to wait for the Lord. God bless you and happy waiting!